This page has been archived here from official Square Enix sources. It was originally posted on 22/03/2012. Connecting all lands and peoples in her everlasting embrace, the sea bears to Limsa Lominsa the wisdom and voices of a thousand shores. In today’s edition, The Harbor Herald examines the imperial machination unfolding beneath Dalamud’s lurid visage. If any of us ever harbored doubt that Dalamud grows larger by the day, that doubt is now surely dispelled; recent days have seen Menphina’s faithful hound burgeon to such proportions as to render its epithet of “lesser moon” seem inappropriate. When Dalamud first began taking on a crimson hue, some few folk regarded it as a portent of evil things to come. In the beginning, such beliefs were met with indifference, and the believers largely scorned. Of late, however, a perceptible change has swept across the land. Brawny sailors are being observed hurling profanities at “Menphina’s bloody cur” for unseasonable storms out upon the high seas. While over in Ul’dah, where wealth ever reigns supreme, wares of dubious utility are flooding the market, one such product being a miracle draught purported to ease chronic backaches triggered by exposure to the lesser moon’s light. According to Ishgardian stargazers, the celestial body indeed draws near. And while this is undeniably a cause for concern, this reporter would remind readers that no good shall come of jumping to conclusions and acting out of fear. For verily, there are other threats to our safety and wellbeing far worthier of attention. In particular, I speak of the Garlean Empire, whose activities upon Eorzean soil have intensified of late. Our sources in the Maelstrom have revealed that imperial troopers have been sighted in Coerthas, within a long-abandoned mine called the Aurum Vale. Those unfamiliar with the mine are like to envision endless veins of gold—and indeed its every surface seems aglitter with the precious stuff. Yet be fairly warned that this is but an illusion born of the mingling of mythril ore and natural deposits of sulfur. Folk are more like to find their death than riches within the Vale, for its underground lakes hold not water but a potent corrosive known as Goldbile, the result of contamination by the two aforementioned substances. Besides scorching the flesh, the liquid also emits a noxious gas that renders breathing an exercise in agony when inhaled, an affliction known as Gold Lung. No living creature can survive being in the Vale for any length of time save those monstrosities that have evolved to thrive in the forsaken environment. The occasional fool is known to venture in, driven by the dream of striking it rich, but the Garlean motive remains shrouded in mystery. One theory posits that the Empire seeks to survey the mines for crystal lodes, but this is as yet unsubstantiated. Military tacticians are in accord that, unlike Dzemael Darkhold, the Aurum Vale serves no strategic purpose, and we are left to wonder in trepidation what diabolical plot the Empire is in the midst of hatching. 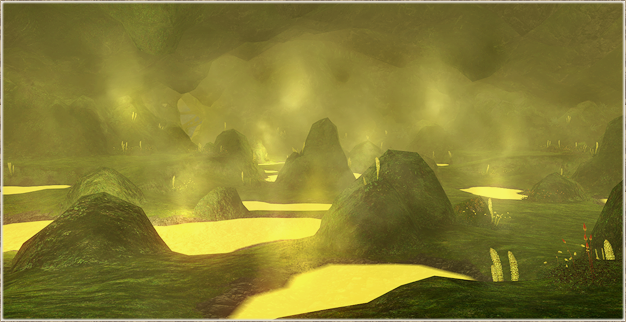 We at The Harbor Herald shall keep our eyes firmly fixed upon all developments within the Aurum Vale, and would duly appreciate the assistance of those adventurers and travelers bearing firsthand information.